Mommy Delicious: Team Jenny American Heart Association 5K and A 1-Month Jenny-Set-Go Program GIVEAWAY! As I have just recommited myself to working out and eating healthy I know the most important reason is to do it for myself. Life can be very hectic but you feel more centered if you have your healthy routine in place. P.S. I love Jenny Craig been wishing I could go back on it! I am trying to eat more healthy. I don't want my kids thinking they can eat anything. I haven't got around to exercising yet, but I sure could use a lot of toning. I love walking and doing Pilates to maintain a healthy lifestyle. I would love to win this for my sister to help start her on the right path. I Like Mommy Delicious and shared the giveaway on Facebook. This is such an awesome giveaway and what a great event!! Sounds Great!! 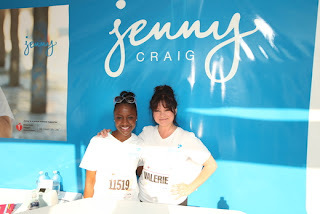 I would love to win this Jenny Craig giveaway! I'm in desperate need of a jumpstart. Single mom to 2, working full-time, and pursuing a BBA is very difficult to find ME time. Anyhoo, I wish all the mommas good luck!! I AM needing to lose weight AND eat healthier, so I'd love to win! Honestly I've never considered Jenny Craig because I didn't think it would fit my lifestyle, but this would give me a chance to try it and make an informed decision. Thanks for hosting it! It's important to have a healthy lifestyle so I can be around to raise my children. Its important to me to live a healthy lifestyle because how you feel affects your mood daily. If you feel good about yourself you are more positive and happier.